Vultures as a group are the most threatened birds in the world. Of the 23 species of vultures in the world, over 70% of them have an unfavourable conservation status, meaning that they’re at risk of going extinct. 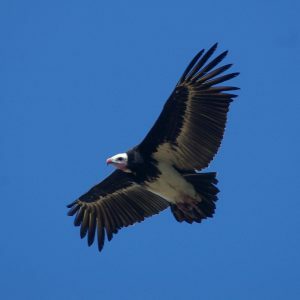 Poisoning is the biggest threat facing vulture populations in Africa, and in particular this threat has grown rapidly with the increasing slaughter of elephants by poachers. 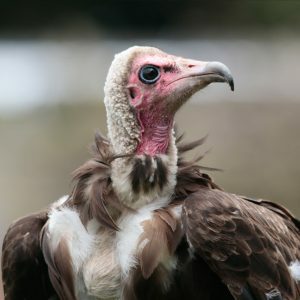 Poisoning associated with ivory poaching now accounts for one third of all vulture poisonings since 1970 and is currently the biggest cause of vulture mortality. 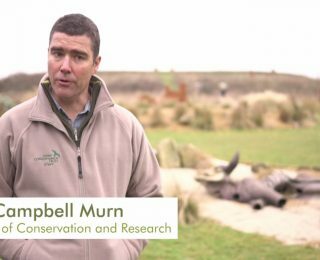 In 2015, our Head of Conservation and Research, Dr Campbell Murn, co-authored a paper that led to the uplisting of six of Africa’s eleven species of vulture to critically endangered. 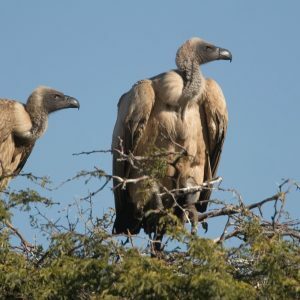 The paper, Another continental vulture crisis: Africa’s vultures collapsing toward extinction, showed that Africa’s vultures are facing a range of specific threats, the most significant of which are poisoning and trade in traditional medicines, which together have accounted for 90 per cent of reported deaths. The African continent is being poisoned at the moment, from the smallest invertebrate to the largest elephants. Watch this video to find out more. Vultures are vitally important ecologically and further losses of populations will be devastating to the African continent. Watch this video to find out more. We need your support to help in the fight to prevent vultures from going extinct. Watch this video to find out more. 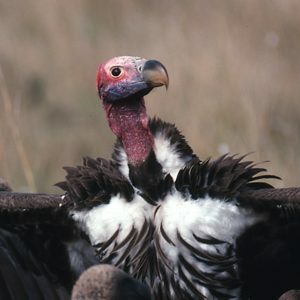 Research led by the Trust’s Head of Conservation and Research, Dr Campbell Murn, published in Oryx – the International Journal of Conservation – has taken the first steps towards assessing the risk from poisoning associated with elephant poaching (A clear and present danger: impacts of poisoning on a vulture population and the effect of poison response activities). 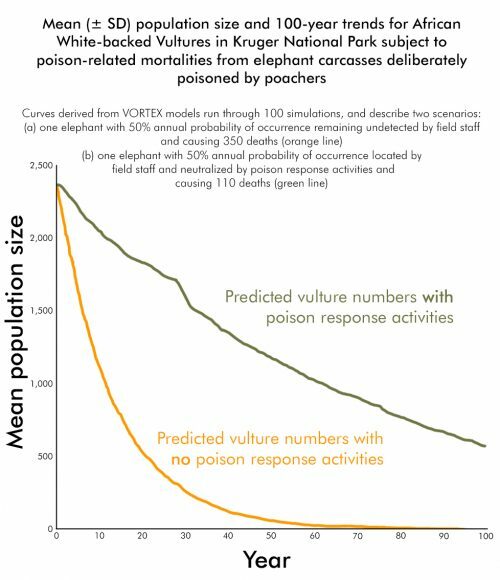 Using a modelling programme called VORTEX, we assessed a population of critically endangered vultures being affected by poisoning. According to the model, poisoning caused large population declines (50-100%) in almost all cases where it occurred. In more than one case, the average time to extinction was 50-60 years. The results show that carcasses of elephants killed by poachers and laced with poison are a clear and present danger; they will lead to local extinctions of vulture populations. More encouragingly, the analysis also showed that where field staff are trained and equipped to neutralise poisoned carcasses and reduce poison-related mortalities, the probability of local populations going extinct is reduced significantly. We have developed a project with partners at the Endangered Wildlife Trust and the University of Reading to provide Poison Response Kits and a training programme to field staff in high-risk areas in southern and south-eastern Africa. This work is extremely important as it trains and equips field staff to deal with poisoning events when they occur. 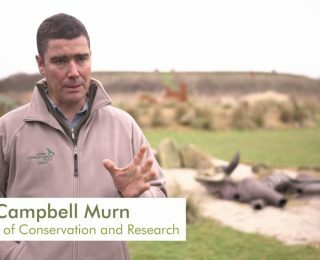 Follow up research by Dr Campbell Murn, confirms that we need to take a targeted approach to effectively conserve African vultures. 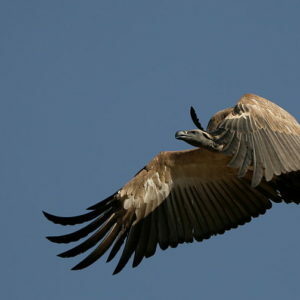 The research investigated the survival rates of two vulture populations in South Africa: Kruger National Park and Kwazulu-Natal (KZN). 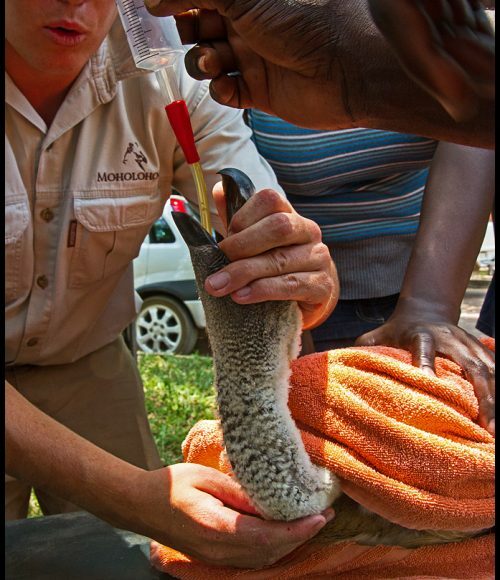 The results showed that adult breeding birds have a higher survival rate in Kruger than in KZN because Kruger has a higher level of protection and poisoning events are fewer. Adult birds forage close to their nesting site, so the birds breeding in the less protected KZN area are at a much higher risk of poisoning. Survival of adult birds is extremely important for vulture populations to remain healthy, so the results indicate opposite forecasts for the two populations. The KZN population is unfortunately likely to suffer rapid declines due to high mortality of adult birds, whilst the outlook for the Kruger population is brighter. The study highlights the need to target conservation work, such as the Poison Response Action, in specific areas. We need to direct activities to areas of high conservation importance, such as breeding colonies and poisoning hotspots. These areas could be protected by initiating Vulture Safe Zones in southern Africa, which are used successfully in South Asia, where our Pakistan Vulture Restoration Project which is working to conserve Asian vultures. Each poison response kit costs £300 and after a poisoning incident each kit needs to be replenished at a cost of £180. You can help us raise the funds needed to provide these kits that could save thousands of vultures and other wildlife from an unnecessary death due to poison. 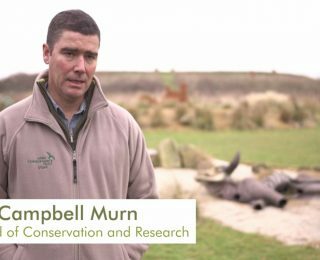 Poison response kits contain a range of equipment and first aid materials and are designed to reduce the impacts of poisoned carcasses on wildlife. Often, poisons are so toxic that vultures can die with food still in their mouths. This means that work must take place as soon as possible to prevent further deaths. With a quick response and the effective use of Poison Response Kits, hundreds of animals can be saved from death by poisoning. In 2018, we are aiming to raise £30,000 to fund 50 Poison Response Kits and replenishments. from just £3 a month, you can make a real difference.